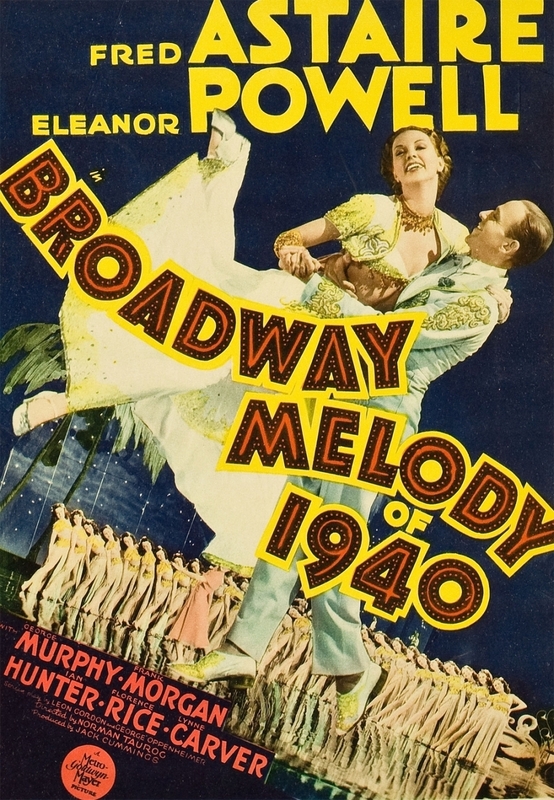 Even by dopey musical standards, “Broadway Melody of 1940” is bad beyond belief. Pauline Kael hated it so much, she was unwilling to admit that any of the dance numbers in it are any good. She was quite wrong about this. Here are two of the best. “I’ve Got My Eyes on You” is an example of Fred Astaire doing his best at what he does best. He plays the piano, he sings, he tap dances, he does tricks with a few props . . . and he does it in six shots. “Begin the Beguine,” which ends the picture, features what is almost universally considered to be the most extraordinary tap dance routine ever put on film. Astaire and Powell have no chemistry whatsoever, but it hardly matters — at least, not when they’re dancing. The art direction and cinematography, along with the number itself, all combine to make it the best advertisement I’ve ever seen for the luxurious pleasure and special chic of black and white cinematography. The mirrored dance floor alone is an amazing achievement; nothing like it had ever been manufactured before: it had to be invented — several thousand square feet of shatterproof, scratch resistant flooring strong enough to withstand a ten minute tap routine — and no glazier in the Los Angeles area was willing to try. Finally, the production team at Metro manufactured it right on the lot. The dancers were never allowed to rehearse on it. Astaire and Powell had to be so confident in their routine that they could execute it to perfection on the first take. The result is dazzling; the extended a capella tap cadenza at the climax goes beyond dazzling — it’s electrifying. “Begin the Beguine” was the swan song for the black and white Metro production number — and also its apotheosis. The set, including the mirrored floor, took eight weeks to construct. The backdrop was a vast, midnight blue* cyclorama. Ten thousand miniature lights were then embedded into it to create the night sky. Mirrors thirty feet tall were placed upstage of the main dance floor, to reflect the dancers. The palm trees and the curtains were made of cellophane. The mirrored floor covered 6,500 square feet, and was created by pouring molten glass into large wooden frames. At the time, the set for “Begin the Beguine” was the largest and most elaborate ever constructed for a Metro picture. The mastermind who designed and engineered it was Merrill Pye, whose brilliant work on “North by Northwest” (1960) brought him his only Oscar nomination. (He lost, as did every other nominee that year, to another Metro picture, “Ben-Hur.”) For “Broadway Melody of 1940,” Pye designed the sets for the musical numbers; Cedric Gibbons (Metro’s Art Department chief) did the rest, and took sole credit for art direction. Pye’s credit, “music presentation,” is misleading, to say the least. Production costs for the entire picture came to $1.1 million. Perhaps most astonishing of all is the production schedule. Shooting began on October 21, 1939 and wrapped a mere twenty-seven days later. “Begin the Beguine” was shot in four days. It’s almost beyond belief that a dance number of such length and fiendish complexity could be completed in two weeks, let alone four days. * In the 1920s, the very glamorous Prince of Wales, a clothes-horse of the first water, started a trend when he introduced evening wear made of midnight blue fabric, as an alternative to the traditional black. As the most photographed man in the world, His Royal Highness recognized the photogenic potential of midnight blue; in black and white photography, the color appeared as a slightly softer black, which showed off subtleties of the tailoring (lapels, pockets, buttons, etc.) to better advantage. This lesson could hardly have been lost on Hollywood designers, though I have no proof that this is the case. It’s regrettable that, by the time “Broadway Melody of 1940” was in the works, His Royal Highness, now styled the Duke of Windsor, had become the world’s best dressed Nazi sympathizer. “It’s Always Fair Weather” was originally conceived as a follow-up to “On the Town.” Halfway through the shooting schedule, Gene Kelly and Stanley Donen, who had successfully collaborated many times before (most notably on “Singin’ in the Rain”), were no longer speaking to each other. The picture was a nightmare to make. The story was more complicated and angst-ridden than audiences were prepared to accept from an MGM musical. It was also booked into some terrible places, including eleven drive-ins in Los Angeles, where it played as a second feature to “Bad Day at Black Rock.” This is not the picture to see at a drive-in. But leaving all that aside, it’s simply not much fun. The composer, André Previn, did his own orchestrations, which gave him more freedom than usual, but he confessed that he was so busy with the orchestrations that the tunes weren’t terribly good. He’s right. (Coincidentally, Previn also did the score for “Bad Day at Black Rock,” which is easily the best thing — perhaps the only good thing — in it.) 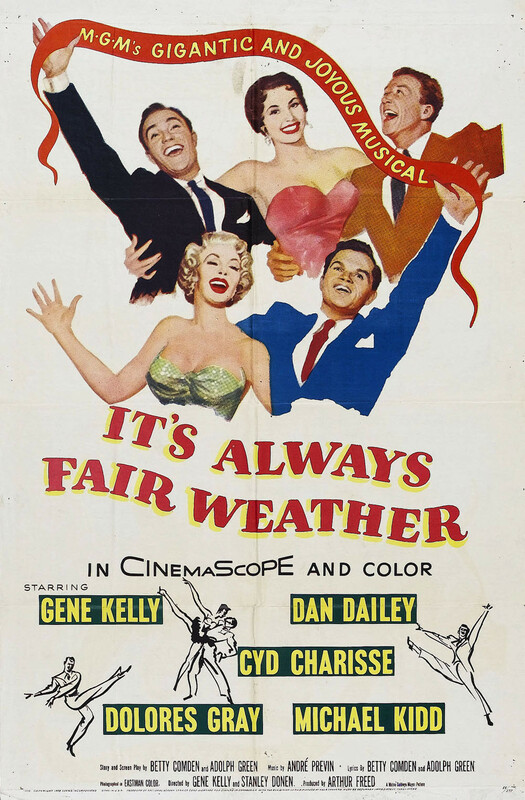 Though it’s mostly all bummer, “It’s Always Fair Weather” does feature one song that I think stands as the best example of what MGM musicals were all about: it’s “I Like Myself,” Gene Kelly’s show-stopping number. Kelly’s solo routine for the title song in “Singin’ in the Rain” is generally regarded as the brightest jewel in the MGM crown, but I contend that “I Like Myself” is even more quintessentially Metro than “Singin’ in the Rain.” The super-wide CinemaScope format was never put to better use. The routine was shot on the perfectly level streets of the make-believe Manhattan Theatre District designed by Cedric Gibbons and Arthur Lonergan. Everything about the number is expensive, perfect, elaborate and artificial. Artificiality is the hallmark of the MGM style. When it doesn’t work it’s awful. But when it succeeds, as it does in “Singin’ in the Rain,” “Dancing in the Dark,” the ballet from “An American in Paris,” and “I Like Myself,” it’s thrilling. Kelly rehearsed this number for twelve days; it took four days to shoot. Total cost was $174,836, but it looks like a million. It’s a shame that the rest of the picture doesn’t work. Cyd Charisse, as a sexier version of Dr. Joyce Brothers, is hopeless. Dolores Gray, as an unctuous television hostess, is too noisy, too knowing, too busy and not at all funny. Dan Dailey, as an alcoholic ad man, gets loaded at a formal affair and runs amok — it’s his big number. It’s supposed to be hilarious. It isn’t. Michael Kidd, whose big number was cut, can’t sing or act. He looks miserable. 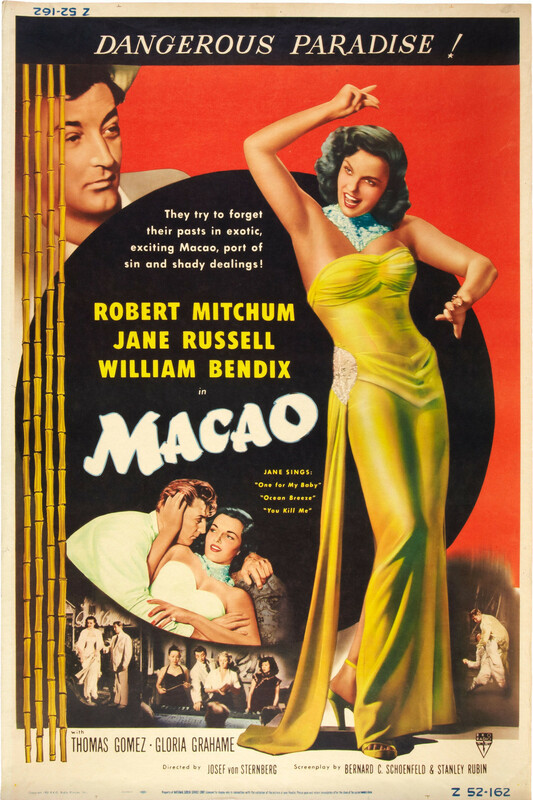 “Macao” (RKO, 1952) is a mishmash of familiar situations from better pictures, but it has several things going for it. As you can see from the poster, Jane Russell sings three numbers. “One for My Baby” is the best song of the three, but she doesn’t bring much to it. Ida Lupino sings/croaks it to much better effect in a crummy noir called “Road House.” Russell fares better with “You Kill Me,” a nice tune by the redoubtable Jule Styne, with lyrics by Leo Robin. This entry was posted in Main and tagged Andre Previn, Begin the Beguine, Broadway Melody of 1940, Cole Porter, Cyd Charisse, Dan Dailey, Eleanor Powell, Fred Astaire, Gene Kelly, Gloria Graham, Howard Hughes, I Like Myself, I've Got My Eyes on You, It's Always Fair Weather, Jane Russell, Jule Styne, Merrill Pye, Metro backlot, Michael Kidd, Nicholas Ray, Robert Mitchum, Singin' in the Rain, Stanley Donen, You Kill Me on May 31, 2013 by TR.